Missing the ‘Pop’ shot…the food bloggers nightmare! 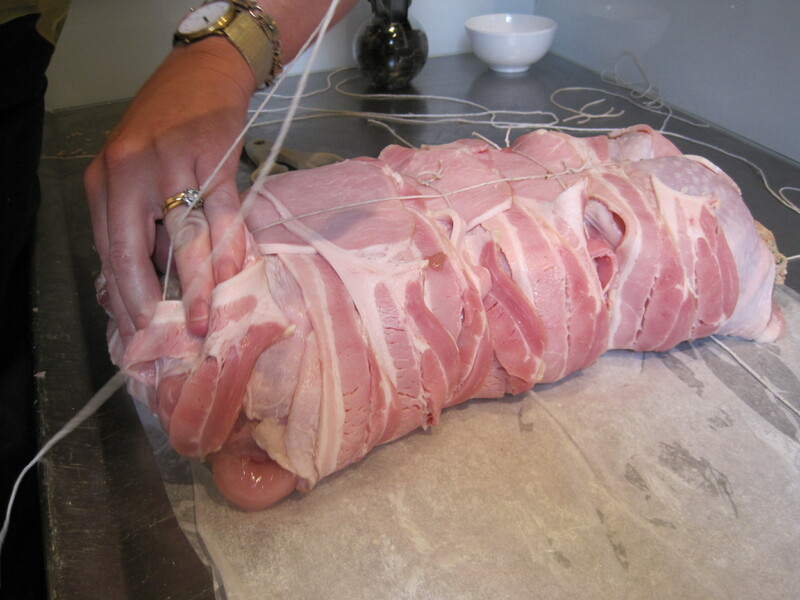 The Turducken incident of 2009. I am relatively new to blogging. It started because I wanted to use photos to illustrate things in my novels that were unfamiliar to readers. And then it changed and I began to put in food references and recipes. 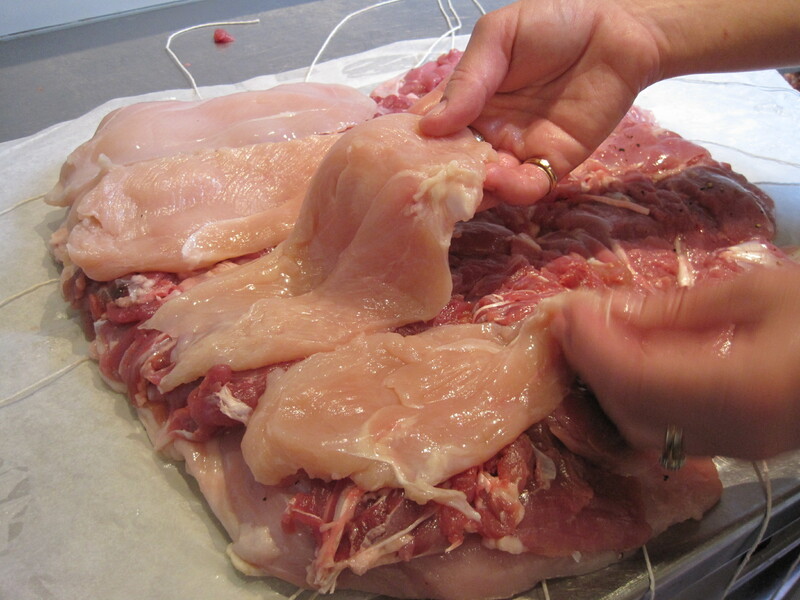 Step 2-Be prepared to take hours to put together a simple recipe. Step 3-Meticulously photograph every step. Step 4-Try not to get chaotic background into frame. Step 5-DON’T FORGET THE FINAL, MAGNIFICENT, COMPLETED SHOT! 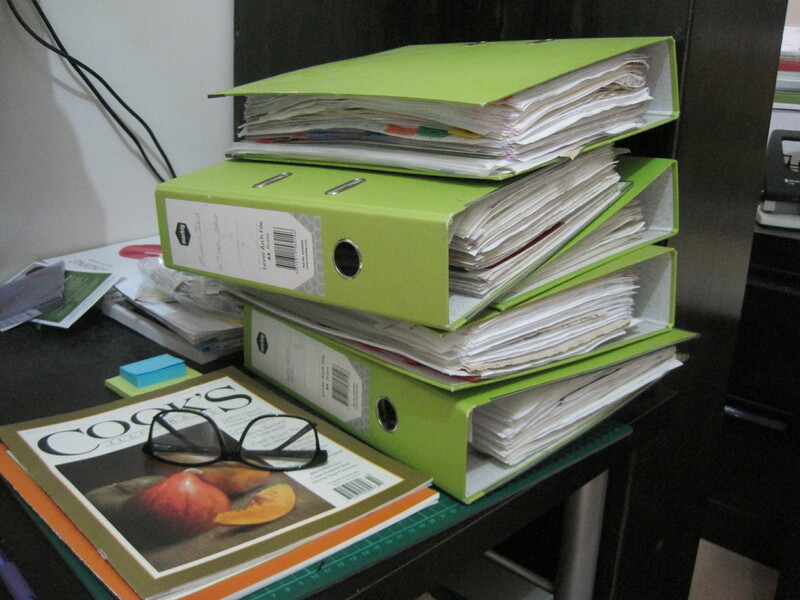 Above you will see a pile of folders, food diaries, kept over the space of about 2 years. Long before I’d ever thought about a blog. They were started when I realised so much of our families history was centered around the meals I cooked and the food we shared. Christmas, a wedding, a funeral or just a humble Sunday night meal in front of the T.V. So much of this was women’s history, very little of it recorded in the books. I wanted to do something to change this and began writing the stories behind the meals along with recipes and photographs of the food. And literally write I did because back in 2009 when I began I didn’t know how to use a computer or type. Each entry was recorded in pencil. I even bought a little camera and printer, taught myself how to use it, and added photos to the pages of handwritten recipes. I loved the idea that these diaries were real records, they didn’t need a special device to be viewed and could be handed down through the generations. 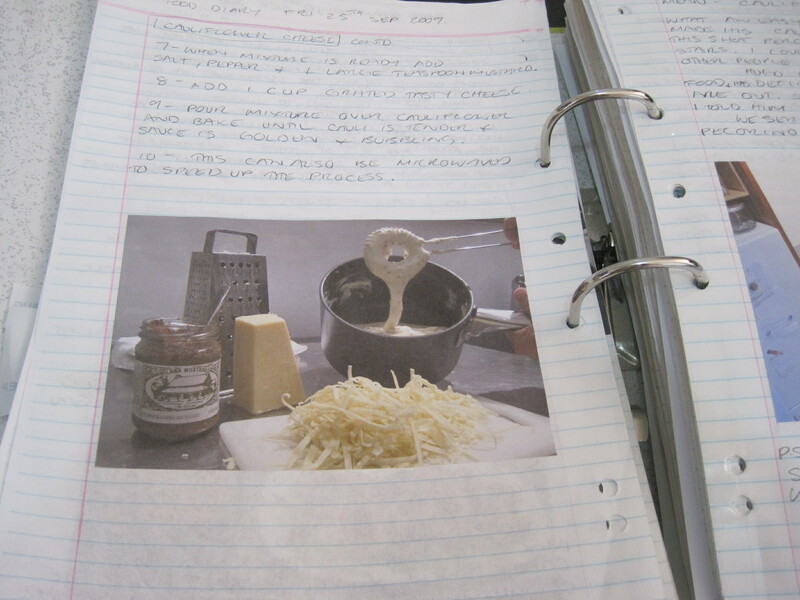 I made the last entry, after about 2 years, when my daughter began to look through them, needing a recipe and reminiscing as a she turned the pages. The 5 thick folders would be enough. You know the problem… you spend hours putting together a recipe and forget to take the finished shot. This mainly occurs if you’re doing something spectacular, you have people coming to dinner and you get a little distracted. All the prep is done, you’ve photographed every stage, the meal is almost ready, you’re in control and have a few drinks with your guests. 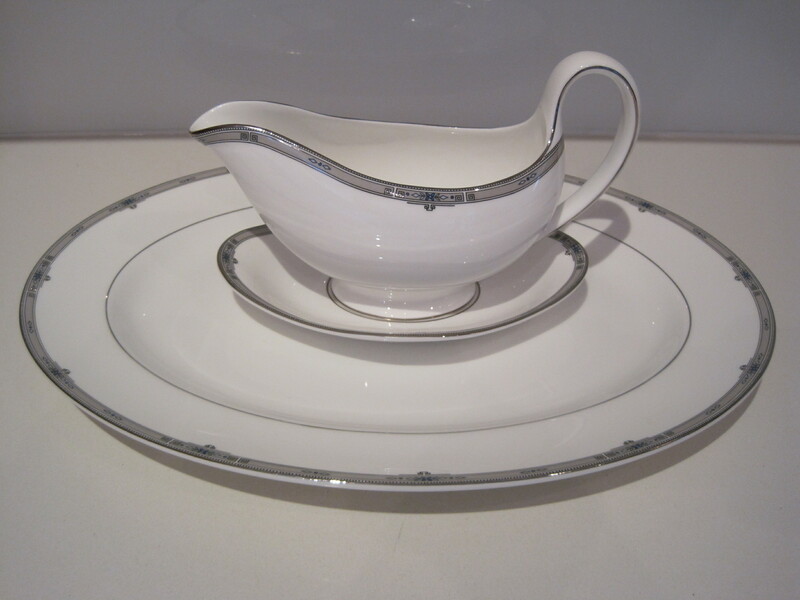 You get them seated at your elegantly set table, serve them and bask in the praise as they hungrily consume your delicious feast and then you remember….YOU’VE FORGOTTEN TO PHOTOGRAPH THE FINISHED DISH! All that’s left is a few bones on a gravy smeared plate. You vow never to drink again! The worst example of this was the CHRISTMAS TURDUCKEN OF 2009. My sister and I had never done one of these before and were keen to try. We de-boned and assembled like true professionals. Gloating and proud of our efforts, we rewarded ourselves with a French Champagne and, with the oven set, took ourselves off for a little nap before that evenings feast. We overslept and both raced back to the kitchen to find the giant beast cooking away nicely. 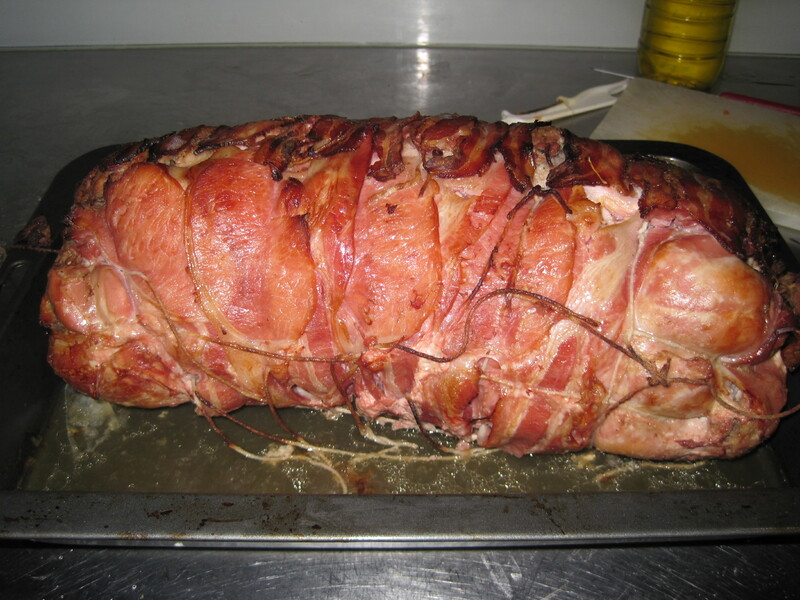 A gorgeous Christmas dinner was had by all, the Turducken a great success, until I remembered not a single photo of the finished beast was taken. So after all these years I will share with you the laborious process we went through to NOT get the final shot for the paper diaries of Christmas 2009. 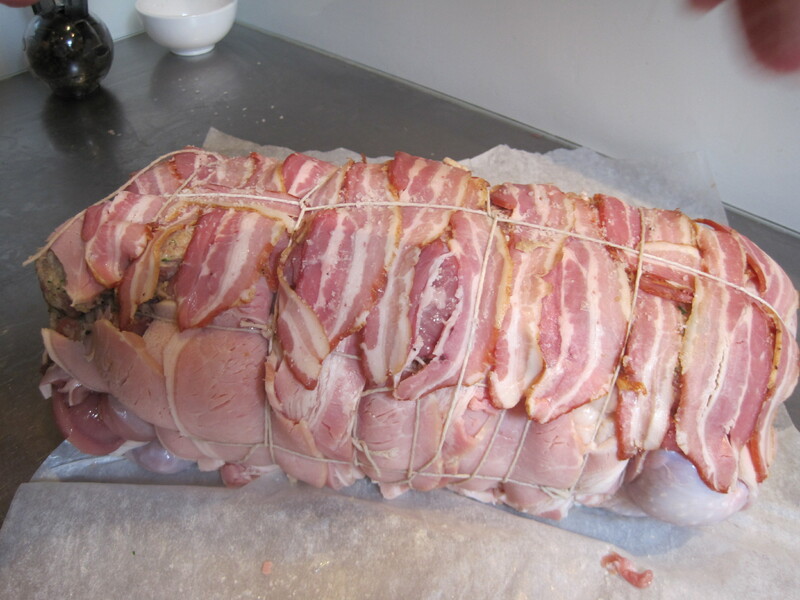 We begin by laying out the bacon approximately to the size of the deboned (and very deflated) turkey carcass sitting in the top left hand corner. 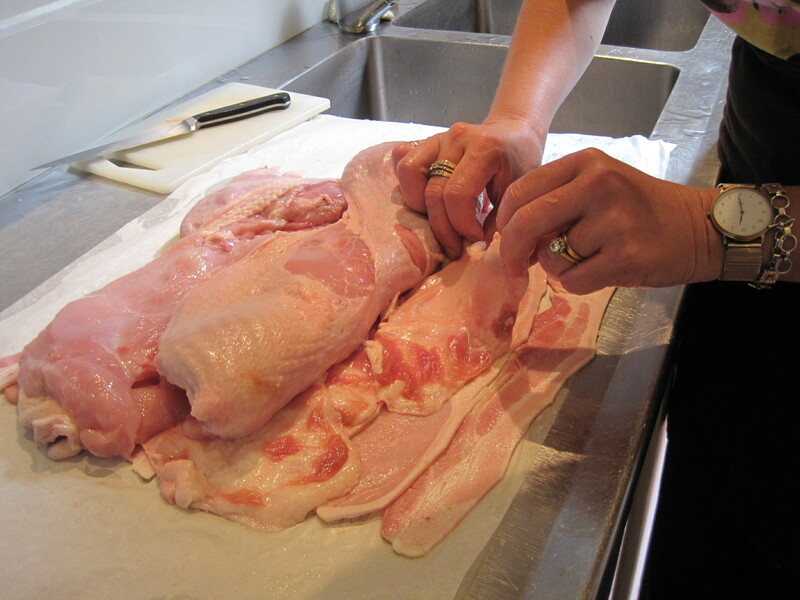 Then unfold turkey onto bacon, remembering to salt and pepper each layer as you go. 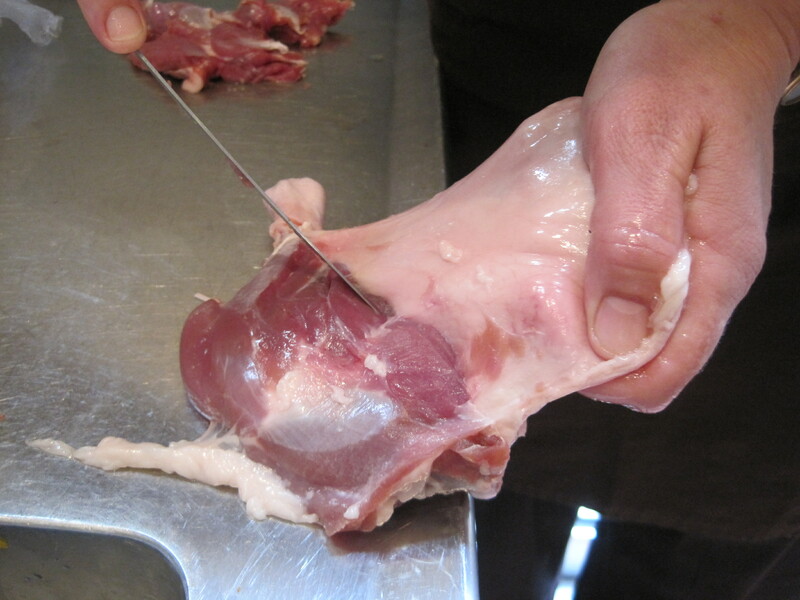 Next we laboriously de-bone the duck legs, setting the fatty skin to one side. Even though duck breast would be easier we have chosen the legs as they will stay moist over the long cooking time. 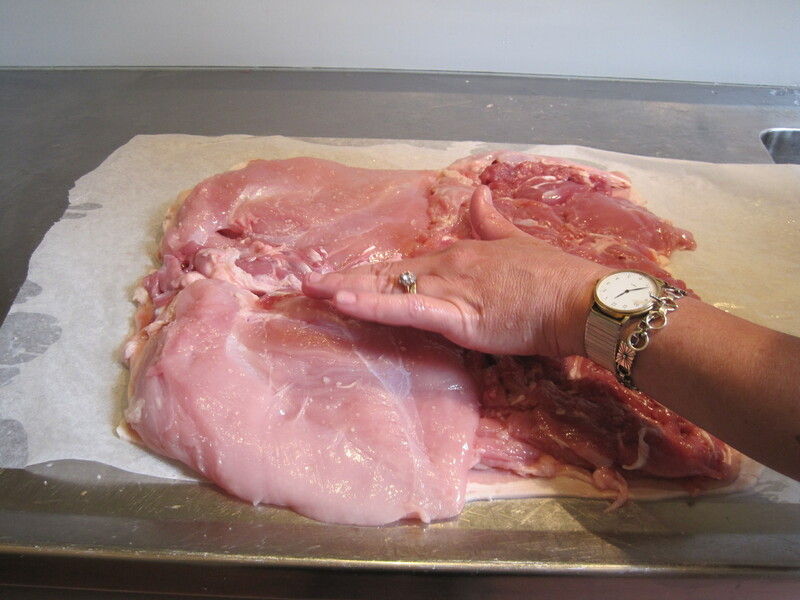 We realise this skin would make a perfect basting outer layer and lift the turkey, add the fatty duck skin onto the bacon and after a bit of a reassemble, put the flattened turkey back on. And then we wonder how the hell this is all going to stay together and pull the whole slab up and lay down lengths of string. Next goes the duck thigh meat. And some thinly sliced chicken breast. Perfect for the last layer as this will need the least cooking time. 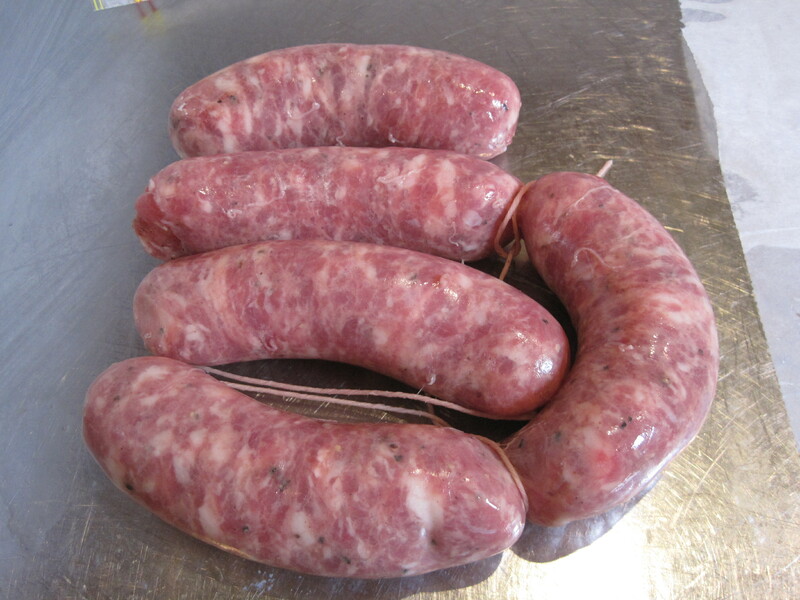 We peel the skins off the Italian pork and fennel sausages and add to a sage, apple, butter and bread stuffing. Then attempt to roll from left to right. This was a four handed job so no shots of the rolling process. 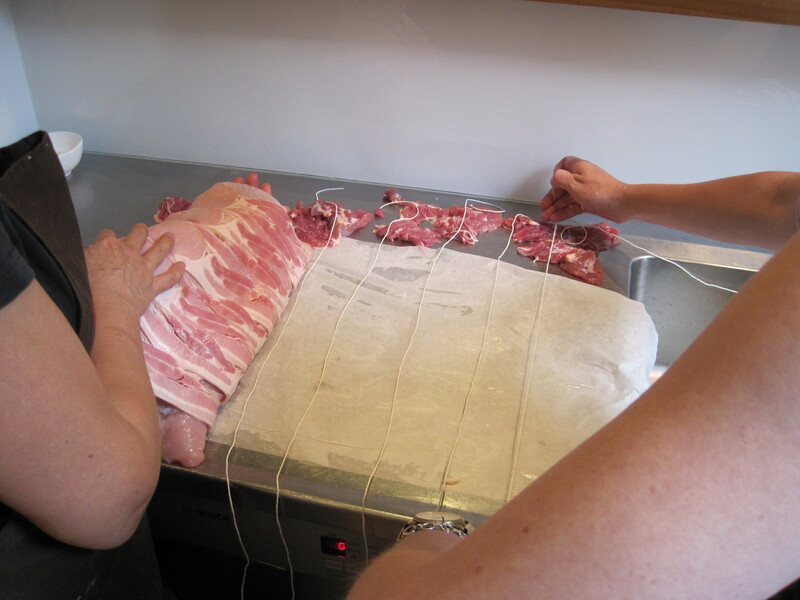 Once the loose strings are tied a layer of smoked Pancetta is added. And a final tying of string to keep the beast together. 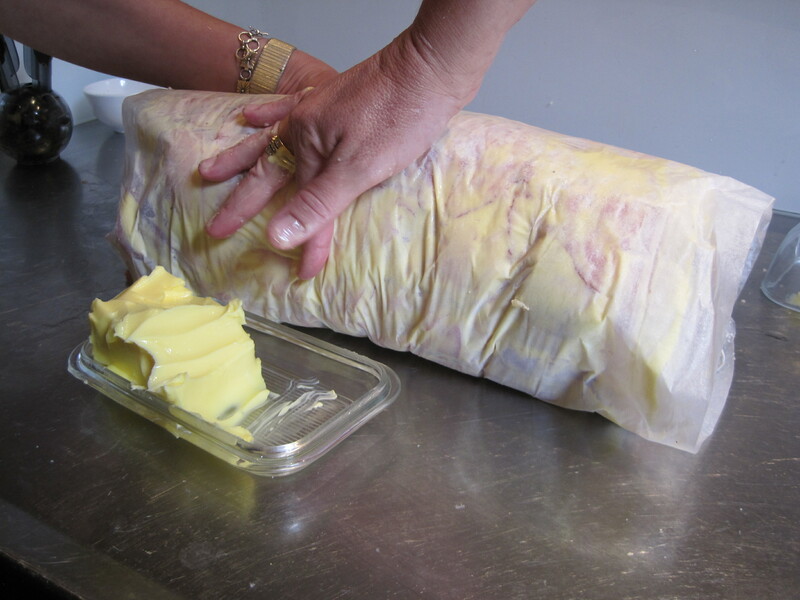 We smear the entire thing in butter and wrap with silicon paper. 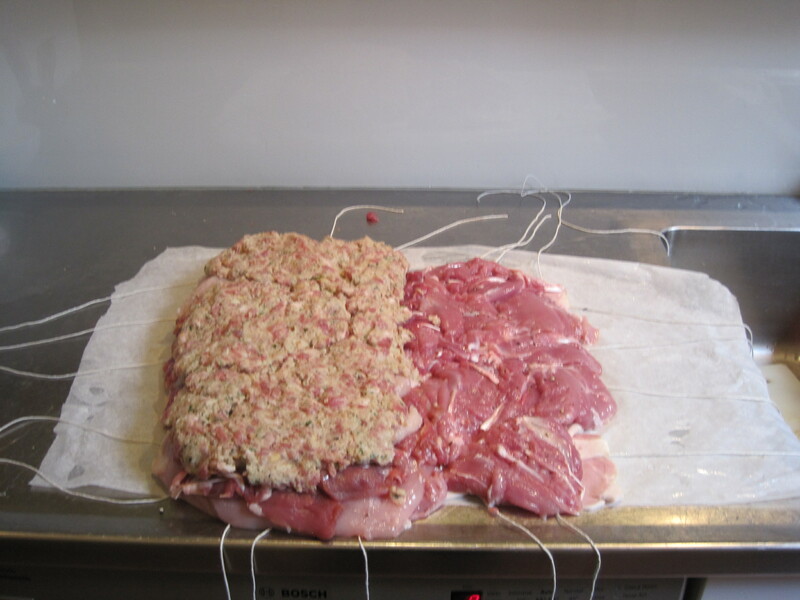 The butter will aid in the browning process and the silicon paper will stop the beast from sticking to the foil. 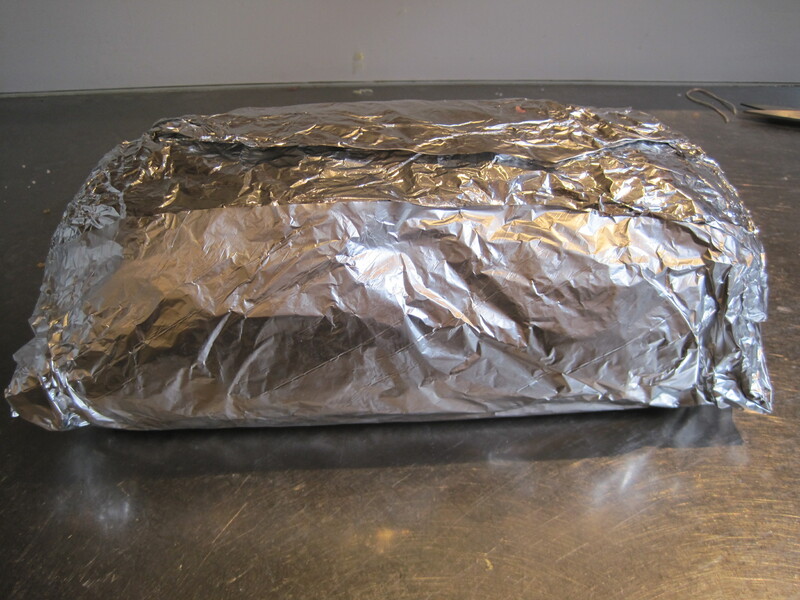 Then wrap again in 2 layers of foil and place in a hot oven. When the juices start to sizzle turn down to 180 c and let cook for about 4 hours. 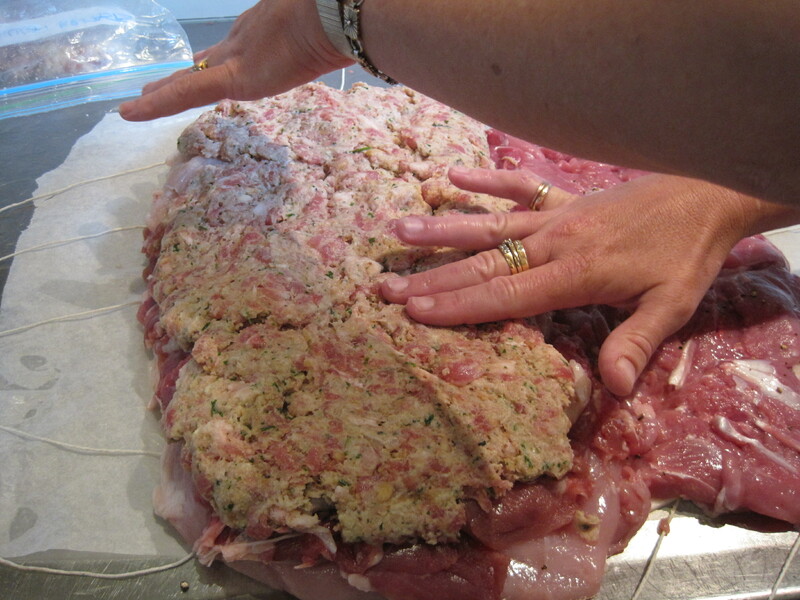 The beast is unwrapped and given a blast under the grill to help it brown. And it sits golden and gorgeous ready to be carved. 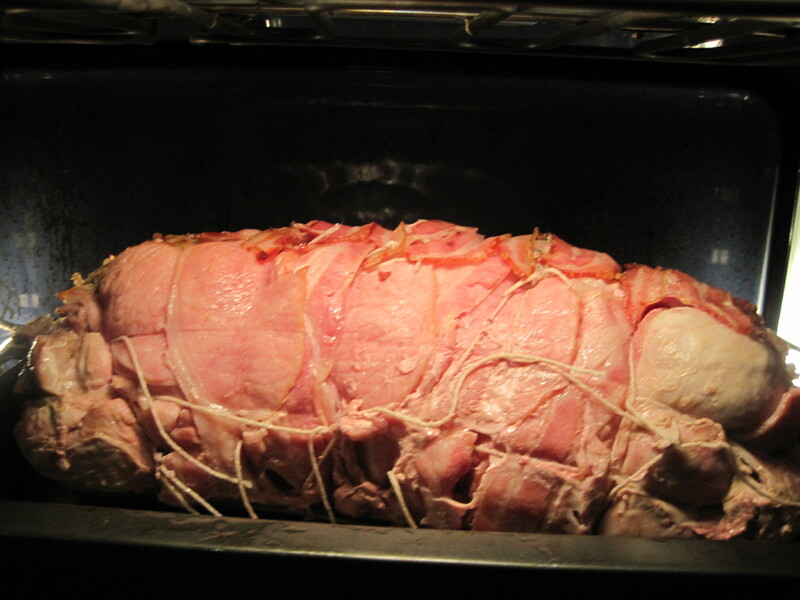 It can rest for at least 40 minutes, covered, while you make a gravy from the pan juices. And don’t forget to check that all string is removed. 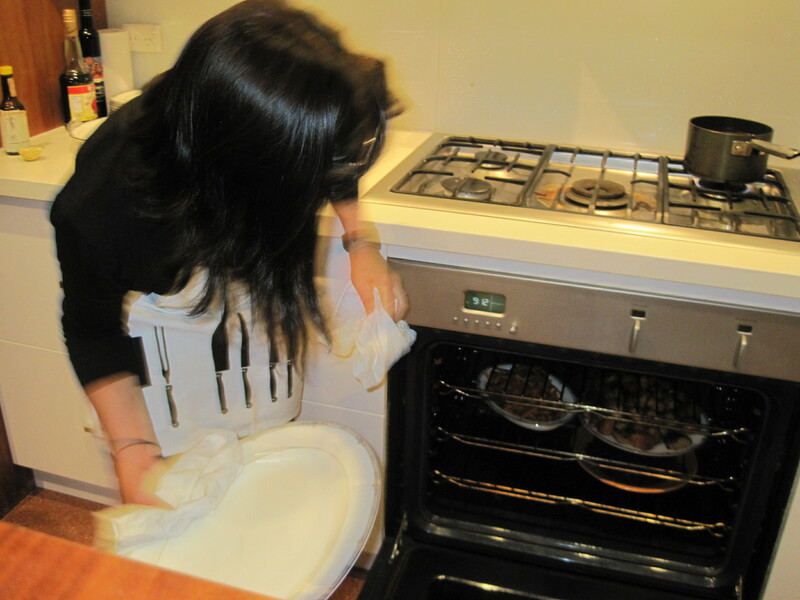 Finally I take the hot serving dish out of the oven and madly race to get the food onto the table…. and the rest , as you know is history. All those lovely layers of poultry, the delicious stuffing and the side dishes now consigned to memory!!!! And the memories were good, our extended family together, talking, drinking, eating. But I still wish that final picture was neatly glued onto the page of that years Christmas entry. This year I will make the same dish and take it to share with our cousins. Hopefully, with all the first stages now photographed, I can remember to take that last shot! I know I’m not alone. What have been your best forgotten ‘Pop’ shots? 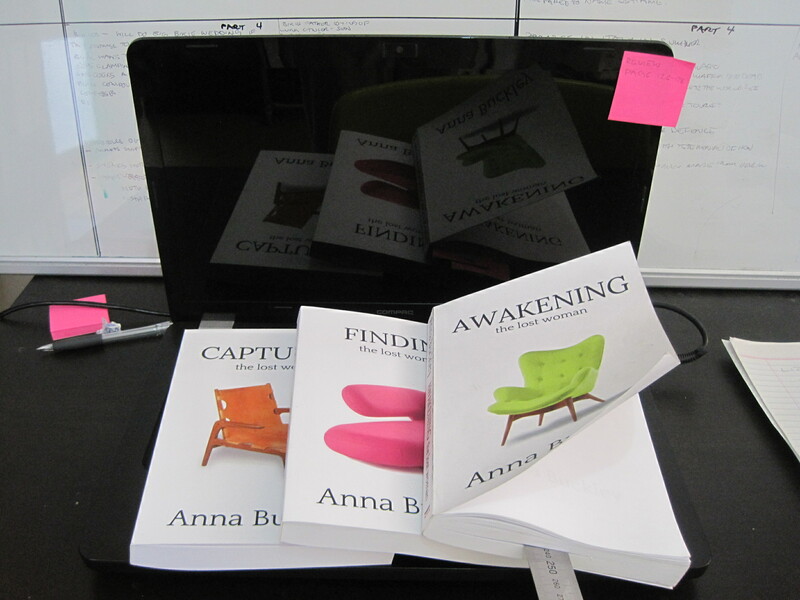 Wow, Anna – that’s quite the undertaking! That’s so frustrating to miss the shot..yes, I’ve done that as well! 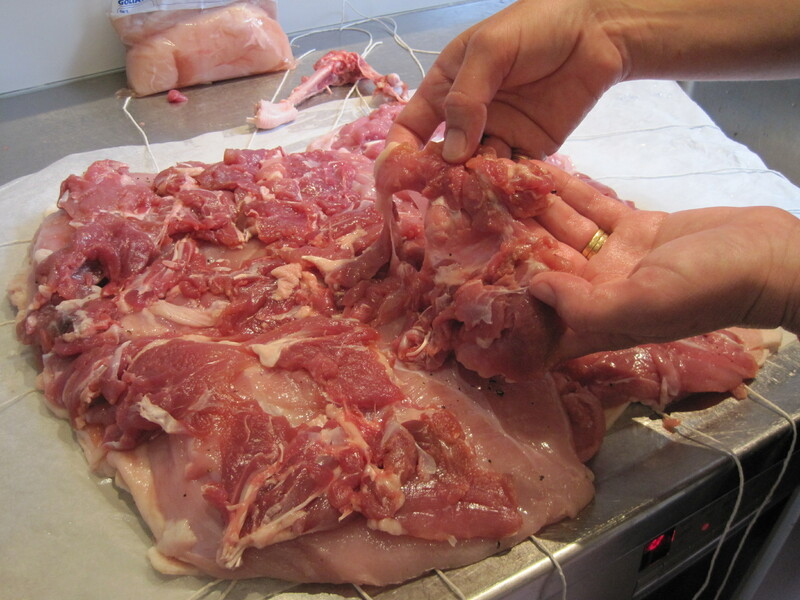 But at least in your case, we can see it under the broiler! 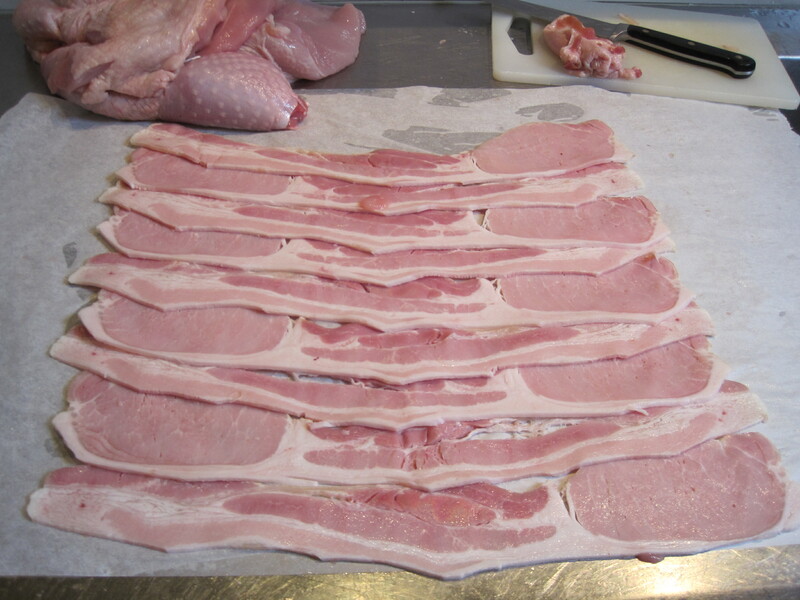 I’ll bet it’s really pretty when it’s sliced with all of those layers. What a labor of love to put together those wonderful volumes for your family, an absolute ton of work, but having it in your own writing & sharing memories is priceless. Hey thanks Deb. 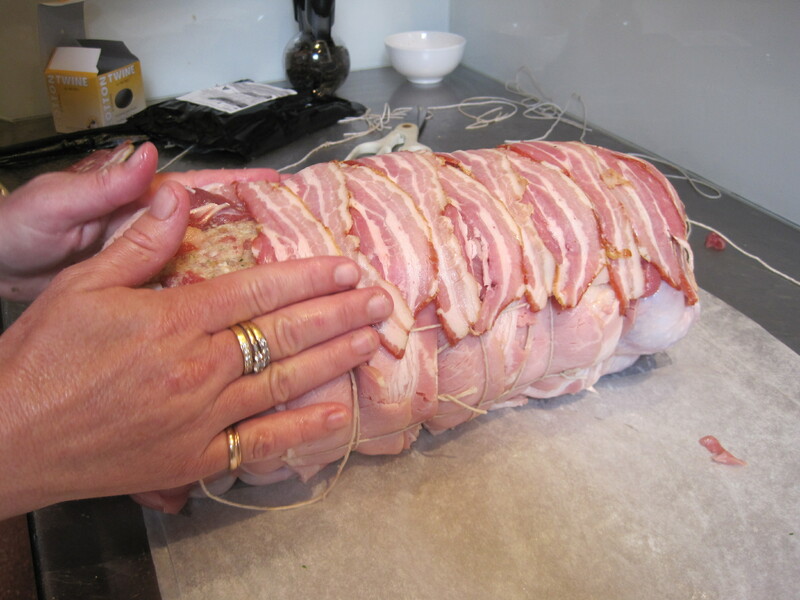 I look at the shots of the Turducken and realise I’ve missed showing the de-boning and the stuffing, probably things that would really have come in handy…And the thing I love most about the Turducken is that it’s easy to carve and then store in the fridge after. Messy hands and the camera…I will give it a go!